Jill McDermott is an Assistant Professor in the Department of Earth and Environmental Sciences at Lehigh University. 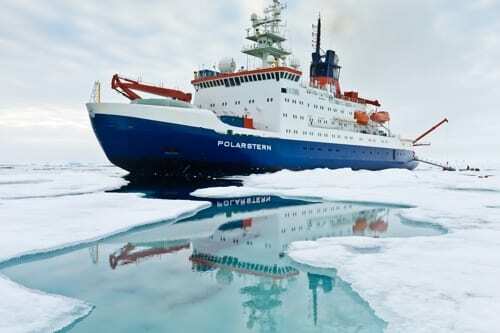 Her research is taking her to the high Arctic to explore for new volcanic activity and ecosystems on the seafloor. Follow along live on the cruise blog. NASA’s mission to the ice-covered ocean of Jupiter’s moon Europa will launch in the 2020s. About a decade from today the first data return may arrive, but in the meantime there is plenty to do on our own planet. This week, I join a rare mission on the German icebreaker Polarstern to do the next best thing – a search for submarine hydrothermal vents in the Arctic Ocean. 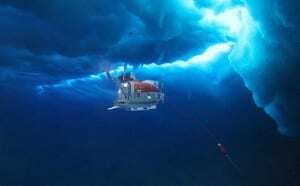 Our goal is to reveal the chemical signatures that accompany life on the seafloor, and track these signals upward through the ocean water to the overlying ice-water interface, and into the ice itself. The idea is to discover an extreme ecosystem living below the Arctic ice to understand how to design a mission for a future space lander. This well-informed lander will make similar measurements while looking for life on Europa’s icy surface. At 87°N 61°E in the Arctic, two of Earth’s tectonic plates diverge along an underwater volcanic mountain chain called the Gakkel Ridge, which stretches for 1,100 miles off Greenland towards Siberia. The plate motion here is the slowest in the world, spreading apart only 0.4 inches per year, at a rate 3 times slower than your fingernails grow. Due to this low tectonic activity, it seemed unlikely that the Gakkel would host hydrothermal vents – places where seawater circulating through fractures in the seafloor rock extracts heat derived from volcanic activity, and rises up to the seafloor in scalding plumes of mineral-laden water. These vents deliver chemicals to the seafloor that provide energy and building materials for specialized ecosystems, a process called ‘chemosynthesis.’ In 2003, however, a team of shocked scientists discovered chemical signatures in the water indicating multiple regions of hydrothermal activity along the Gakkel Ridge. All scientific research requires patient dedication, and this expedition builds on years of risks, set-backs, and successes of many colleagues. The deep ocean is harsh. The freezing waters of the Arctic are even less forgiving than the mid-latitudes, and little is known about the seafloor ecosystems that are living there, undetected for tens of millions of years. In the coming weeks, I may be among the fortunate few to collect the first samples at the seafloor at one of the Gakkel vent sites. We are aiming for a particular location in the Arctic, the Karasik Massif, an underwater mountain that rises rapidly from 15,400 feet depth to 1,850 feet depth. The Karasik Massif lies along a fault, a break in the seafloor rock that cuts through thin ocean crust into underlying ‘ultramafic’ rocks that formed deeper in Earth’s mantle. The ultramafic geologic setting makes this site an exciting target for exploration due to the geochemistry that arises when circulating fluids interact with iron-rich rocks at high temperatures and pressures. 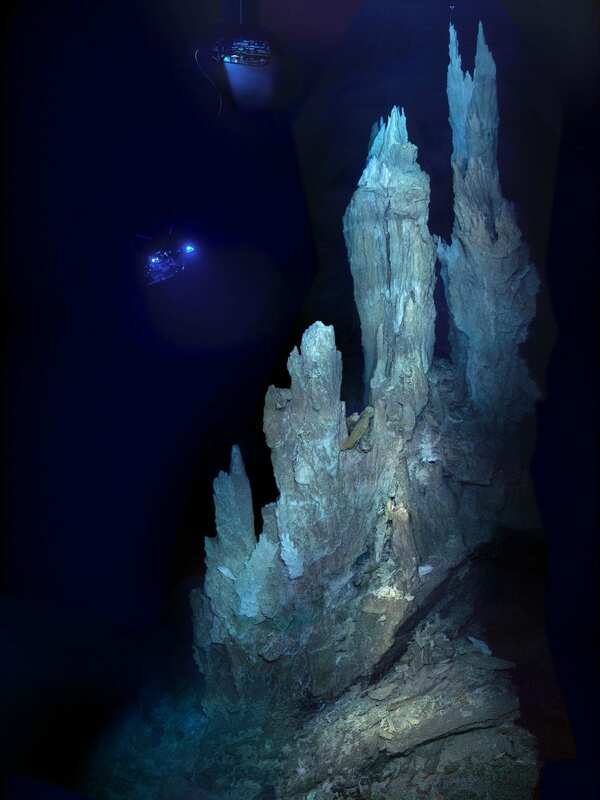 Similar conditions exist at two other known hydrothermal fields in the Atlantic Ocean, Lost City and Rainbow, where vent fluids expelled at the seafloor are rich in dissolved hydrogen gas. The enrichment in hydrogen gas means there is great potential for the chemical, or ‘abiotic’ formation of organic molecules like methane and formic acid – possible precursors to the prebiotic compounds from which life on Earth emerged. There are only a few well-characterized seafloor ultramafic vent sites, however, and every one is different. This expedition is vital to understand the full range of chemical and biological diversity possible around Earth’s chemosynthetic ecosystems. One challenge to studying the chemistry of modern vent fluids is that living things now permeate our planet. Organic compounds can also be generated and consumed by life itself, of course, and active microbial communities living in the seafloor around the vents rely on chemical energy from compounds emitted by the vents, such as hydrogen and methane. My goal on this expedition is to collect vent fluids and characterize their geochemistry, including distinguishing abiotic from biotic chemical processes, and how these influence the generation of life-related biogeochemical signatures. To collect the vent fluids, we will launch the Nereid Under-Ice, a new remotely operated underwater vehicle developed and operated by the Woods Hole Oceanographic Institution . The Nereid UI will first be deployed in free-swimming autonomous mode to make high-resolution seafloor maps and track down the vents by measuring chemical clues, such as particle-rich water and locations where the seawater is relatively rich in hydrogen and methane. Once the exact location of the vent site is known, the Nereid UI will transform and launch again, now tethered by a fiberoptic cable the width of a human hair. I will equip it with titantium syringes that can collect vent fluid samples and maintain seafloor pressures until the samples are back onboard the ship. There my colleagues and I will begin the exciting task of understanding the origin of these fluids, how they sustain life on the Arctic seafloor, and what this means for life detection on other planetary bodies in our solar system and beyond. Research support includes funding from the National Aeoronautics and Space Administration and the Alfred-Wegener Institute.